I have never been a big fan of taquitos but the kiddos just love them. I made beef this time around but think chicken would be even better. You have to have a "no fear" kind of mentality when cooking these puppies! Hot oil burns, or so I have been told. This meal takes a little planning but is really worth the time. 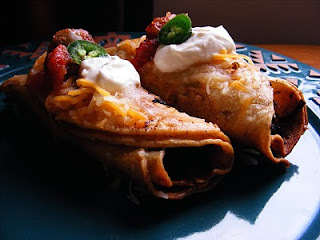 I served our taquitos with rice and of course my favorite, pinto beans. This is What's Cookin on this ice storm warning day, I just hope for the foot of possible snow they are predicting instead. Place all of the ingredients in a soup pot and cover with water. Cook over medium heat with lid on until roast falls apart. I cooked this one for about 4 hours. Now remove roast from broth and shred roast. Now wrap three of your corn tortilla in a damp paper towel and microwave on high for 30-40 seconds. They should be rollable now. Place about a 1/4 cup of the meat in the middle of each corn tortilla and roll up. Pour oil a quarter of the way up in a heavy bottomed skillet, I used my cast iron. Heat oil over medium heat. Lay each taquitos seam side down. Fry for 4 minutes or until golden brown and then turn and repeat. Serve with salsa, sour cream, pico. Oh, YUM. I love me some taquitos. Can't wait to try homemade. With a QT no where in site on Beaty's Creek I had to get creative. ;) I hope you like these! These sound so yummy, however if you are a total wimp like myself when it comes to spicy things, what peppers would you suggest using in place of the jalapenos? Or should I just turn and walk away hanging my mild-taste preferred tongue in shame? Use canned Hatch green chili peppers or better yet fresh ones! These sound great, Stacey! I bet my kids would love these, and Eric too! I might make some for the Super Bowl :) I didn't realize they were so easy to make at home ;) I might leave out the peppers altogether though...Im the only one who likes peppers-except jalpenos, which Eric likes, but he can add spice with a dip or taco bell sauce-lol! You really cannot taste the peppers, just adds a little spice. :) You cook so well I am sure yours will be tasty no matter what you do! Okay these i am going to have to make...wow YUM-O!! !